To prepare chips, brush oil evenly over one side of each tortilla. Combine sugar and cinnamon; sprinkle evenly over oil-coated sides of tortillas. 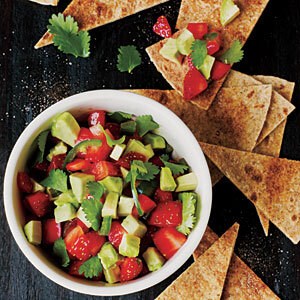 Cut each tortilla into 12 wedges; arrange wedges in a single layer on two baking sheets. Bake at 350° for 10 minutes or until crisp. Combine avocado and remaining ingredients; stir gently to combine. Serve with chips.